Set the mood with a network of stylish LED candles. Options for smart lighting are becoming more prevalent of late, especially with more households owning at least one Amazon Echo or Google Home device. But many manufacturers are focusing on producing just the light bulb itself as opposed to a full lifestyle solution, which is why Yeelight's Candela caught my attention during our recent trip to CES. 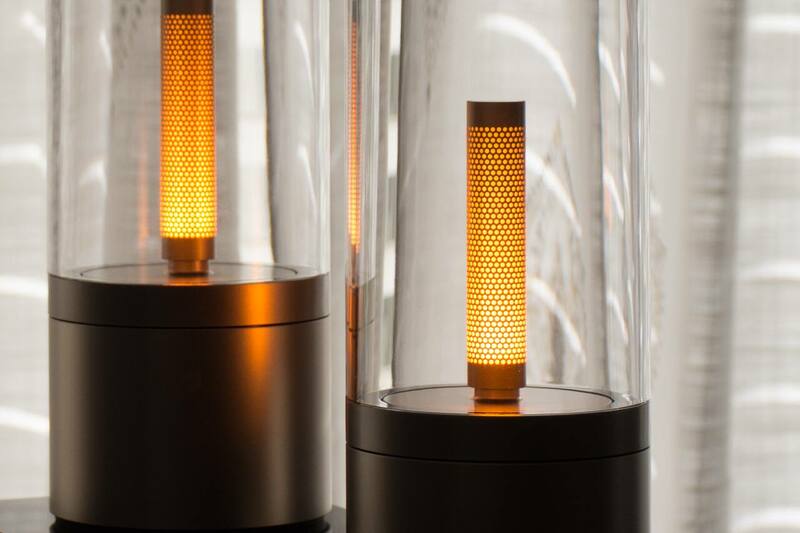 Using Bluetooth Low Energy (BLE) technology to create a mesh network, you can connect thousands of app-controlled, battery-operated Candelas to simulate a warm, candle-lit environment. 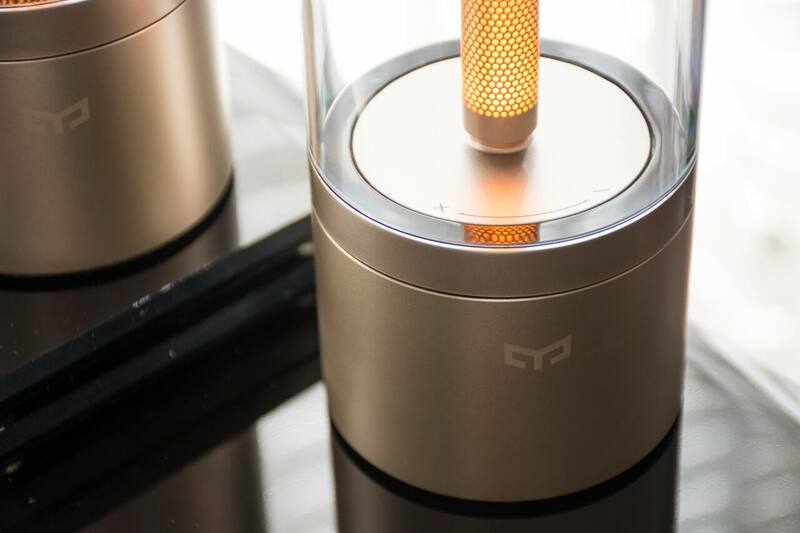 Let's take a closer look at Yeelight's all-new Candela to see if it successfully bridges the gap between technology and lifestyle. Special thanks to Yeelight for sending two Candelas for us to experience! 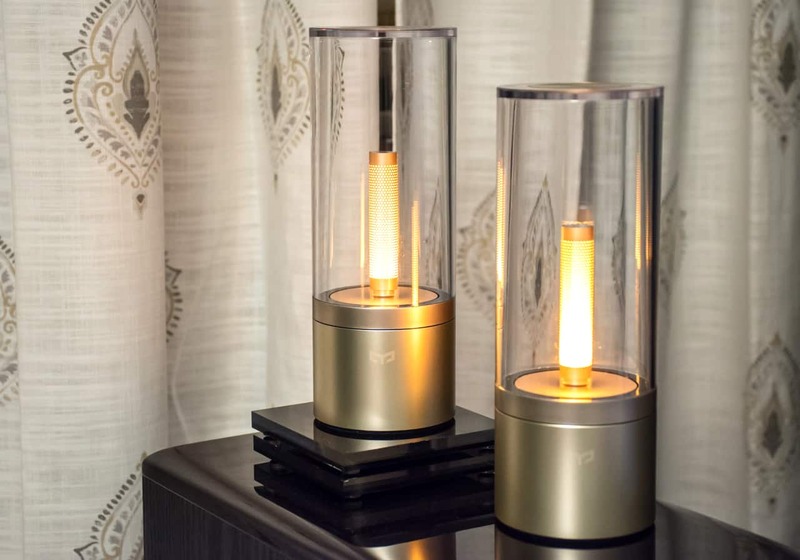 Sporting a soft champagne-colored base and a clear polycarbonate housing, I can envision Yeelight's Candela being offered for sale by a premium furniture store like Crate & Barrel or West Elm. Its modern, minimalist design language helps it blend into a variety of living spaces while offering a hint of techie flair, and the specially-tuned color temperature from the LED lighting element produces a warm glow without actually emitting any heat. In the hand, Candela feels robust and well-made, and features a rubberized bottom to give it more grip on smooth surfaces. With the built-in battery, you have the freedom to place Candela virtually anywhere. Want to have a candle-lit dinner on the patio? Place one of these on the table and dine surrounded by the colors of the sunset. Operating it is as simple as rotating the clear housing left or right, and the "step-less" dimming smoothly adjusts brightness so you can set the perfect scene. If you have more than one unit, they can be grouped together and controlled simultaneously from any Candela — rotate any one to have all others in the group mimic the same brightness setting. To sync multiple units, set the power switch (located on the bottom) to "Bluetooth" and continue with the Yeelight smartphone app (iOS or Android) to create a new "group." The app is pretty straight-forward, save for a few spelling and grammatical errors, and I was able to pair two Candelas in a few easy steps. Pair each Candela with the app. Create a new group and give it a name. Add each Candela to the named group. Once the Candelas are grouped, they will remain together until you reset them, even after they've completely depleted their batteries. 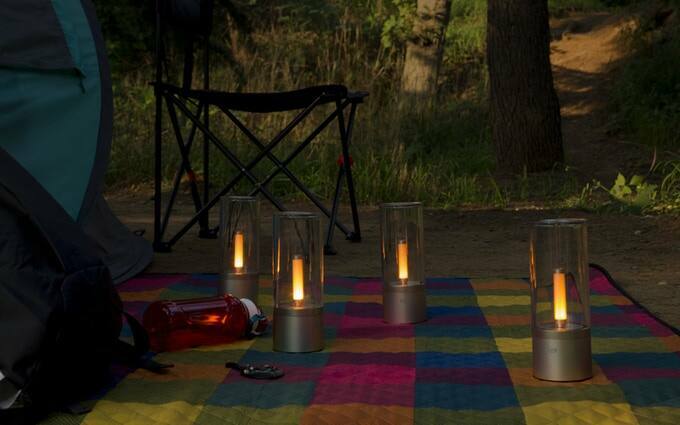 You can also operate your Candelas — either together or independently — via the Yeelight app. But since these units are Bluetooth only, you'll need to be in physical range for the app to connect. This also means that Candela will not work with IoT devices/apps, like Amazon Echo, Google Home, IFTTT, etc because it doesn't have Wi-Fi capability. No need to worry though — unless you absolutely need to control things with your voice — because the Bluetooth range is very good. I placed one in the living room and another upstairs in the opposite corner of the apartment, and the two Candelas stayed synced. For those who plan on placing Candela in harder to reach places, like a high shelf or window sill, it's worth noting that while the lighting element can be turned off remotely, the base still remains powered on for the sake of the Bluetooth connection. It will continue to draw power and deplete the battery unless the switch is set to the "off" position. If you don't plan on moving Candela often, it's best to keep it plugged in via the supplied USB cable and wall adapter. Is Yeelight's Candela Right for You? Shoppers who frequent high-end furniture stores like Crate & Barrel, CB2, or West Elm probably won't bat an eye at the $59.99 retail price for Candela, but for most Slickdealers, this is a difficult cost to justify, especially if you're solely looking at the technology being offered. Of course, some may argue that you can't place a price on design value, but keep in mind that in order to take advantage of Candela's best feature, Bluetooth Mesh, you'll need at least two devices. So realistically, you're looking at a potential starting price of $120 if purchased separately, or 2 for $95.98 with a current promotion on Amazon. But when you take in to account the regular cost of a similar-performing Philips Hue smart bulb ($30) or TP-Link smart bulb ($30), then $47-ish for each self-contained lighting solution (made out of premium materials) doesn't seem so bad. Overall, I've enjoyed living with a pair of Candelas. They easily add style and warmth to any room or outdoor social area, and the potential for expansion is nearly limitless (connect up to 30,000 units). In terms of supplemental mood lighting, Yeelight's Candela offers thoughtful design and advanced connectivity features in a visually pleasing form-factor, but its cost is aimed at those with lifestyles that lean more toward luxury than utility. Don't get me wrong — I really like the Candela, and if enhancing your home's ambience is a priority, these will definitely get the job done. I just feel the original asking price doesn't quite match the value it delivers, especially when I have in mind the savvy shoppers in the Slickdeals community. If you're interested in the Candela, be sure to set a Deal Alert to be automatically notified when there's a price drop!